Quentin Tarantino Is Directing A Star Trek Movie? The unexpected might have just happened. Director Quentin Tarantino, the oddball behind Kill Bill and Django Unchained, is developing a Star Trek film with J.J. Abrams. Of course, the film is still in very early stages and everything could change. For now, QT is working on his upcoming film for Sony. I really think this could be AWESOME!! The New Mutants (Marvel) is turning the comic book, super hero, genre on its head with more of a horror movie vibe to it. Now they’re looking to change other genres. If he’s working on it with Abrams, I’m guessing it’ll be a continuation of the Kelvin timeline. It’d be interesting to see them do a Kelvin version of the TNG story. Vampires in space? Bloody shoot outs? What could he possibly bring to the table? It would be like having George R. R. Martin write it. Dark humor and people are probably going to die. I don’t mind Quentin’s movies but I don’t think he belongs in the Star Trek universe. But they are NOT Star Trek! I have loved Star Trek since TOS originally aired and I love the JJ film’s and that cast as much as all the other entries in the franchise. I agree, I love TOR, it is even more ST than ST. Since STD is *not* ST, you are correct! I’ve only seen the pilot from STD. Didn’t give me much to like. there goes the franchise into the bullet-ridden toilet. Hes a big fan of the series and wants to do an updated faithfully done big budget version of one of the episodes… Or even draw inspiration from it… Sounds good to me…. There’s no way paramount would put out an r rated star trek so it could work. oh, what if the dishonored klingon has a buddy, who was captured by the borg, and in saving him, he lost even more. so an arch could be them reclaiming the fallen klingons? Oh dear god! 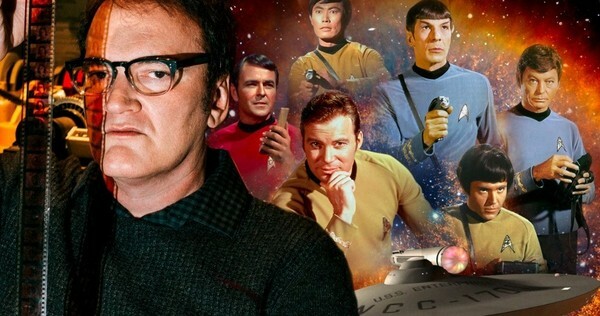 Sooooo many red shirts are going to die…..
Quentin is a good director, and if he kept to canon I could see him making a bloody good Star Trek movie, because he’ll give us back a good story rather than one so full of plot holes that it needs to rely on special effects to paper over the cracks. Yep the year trek died 2017. First disco. Now this possibly happening? I won’t ever watch anything he does unless or until he walks back his anti-police officer stance. I skipped hateful 8 due to his attitude towards cops. But yeah the year trek was killed by paramount 2017! it couldn’t be any worse than the 2 shite previous movies – shame really as the 1st reboot film is actually v.v.good! Having an actual Star Trek fan at the helm I think would do it justice. Look how well Orville is doing! Umm… Orville is a TV show, not movie, and it isn’t even doing so well compared to shows outside of Fox. FOR Fox, it is doing okay. Anywhere else it would be considered to be limping along if not cancelled by now, with the ratings it has. I’m not talking about ratings as much as the enjoyment of the fan base. Tarantino has demonstrated with CSI that he can make a part of the franchise that is not necessarily his “version” of things. He is versatile. While I am not a huge fans of his films due to the violence and profanity that he uses, I do not assume that he will make Trek film that has all of that in it. I don’t see him doing a Kill Bill in space. He is a compelling film maker, and this could be a good thing for the franchise. Let’s see where they go with it. Not gonna lie, I’m a little worried.